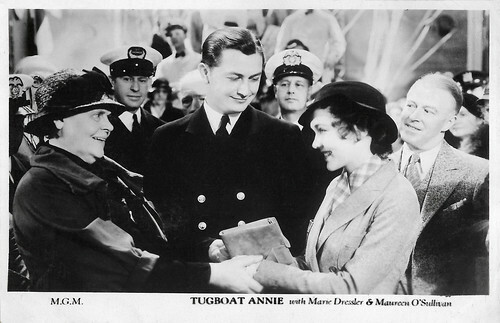 In Tugboat Annie (Mervyn LeRoy, 1933), Marie Dressler features as the 'old sea cow' Annie Brennan, the tugboat captain of the title. Dressler gives a funny and touching performance. The film became one of the top moneymakers of the depression era, and was beloved by the public as well as the critics. 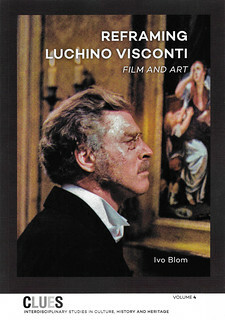 Film Weekly published a little series of postcards on the film. British postcard in the Filmshots series by Film Weekly. Photo: M.G.M. Publicity still for Tugboat Annie (Mervyn LeRoy, 1933) with Wallace Beery and Marie Dressler. 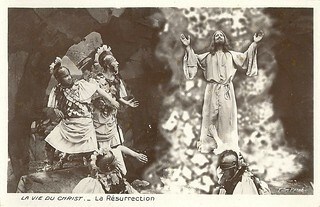 British postcard in the Filmshots series by Film Weekly. Photo: M.G.M. Publicity still for Tugboat Annie (Mervyn LeRoy, 1933) with Marie Dressler, Robert Young and Maureen O'Sullivan. 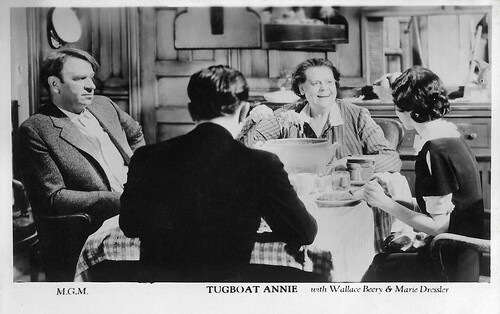 Tugboat Annie (Mervyn LeRoy, 1933) is based on stories about a female tugboat captain, written by Norman Reilly Raine and published in the Saturday Evening Post. The film was the second and last teaming of Marie Dressler with Wallace Beery after their big hit with the bittersweet Min And Bill (George W. Hill, 1930), for which Dressler won an Oscar. Here, Beery is her often-drunk husband and together the comically quarrelsome middle-aged couple operate the tugboat Narcissus. Robert Young is their grown son, ashamed of his drunken father, and Maureen O'Sullivan is his fiancee. With their chemistry and craft, Dressler and Beery pull off the slightly weak and episodic story. Despite her age and weight, Marie Dressler was queen of the box office when she made this film. 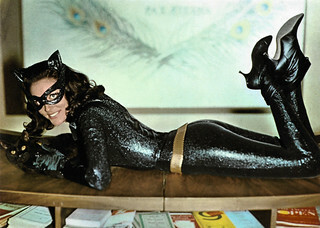 She was beloved by millions of film fans. Dressler would follow this up with her very grand performance in Dinner at Eight (George Cukor, 1933), where she was briefly reunited with Beery for one scene. After one more film, she would retire due to her terminal illness. She would die of cancer in 1934. 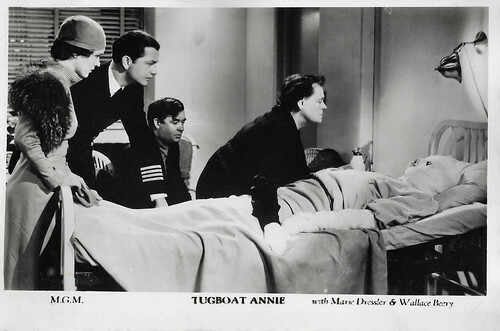 There was a sequel called Tugboat Annie Sails Again (Lewis Seiler, 1940), with Marjorie Rambeau as the widowed Annie. But Tugboat Annie remains one of the finest and most fondly remembered performances of Marie Dressler. British postcard in the Filmshots series by Film Weekly. Photo: M.G.M. Publicity still for Tugboat Annie (Mervyn LeRoy, 1933) with Maureen O'Sullivan, Robert Young, Paul Hurst, Marie Dressler and Wallace Beery. British postcard in the Filmshots series by Film Weekly. Photo: M.G.M. Publicity still for Tugboat Annie (Mervyn LeRoy, 1933) with Marie Dressler, Wallace Beery, and Paul Hurst.